The folks over at Terminal Gamer have posted the gaming fact of the day and it happens to relate to our beloved Ocarina of Time. The actual fact is that Ocarina of Time is the highest rated game of all time. Here is the excerpt from their web page. The highest-rated videogame ever is Ocarina of Time, the fifth game in the Zelda series, which has an average online rating of 98%. 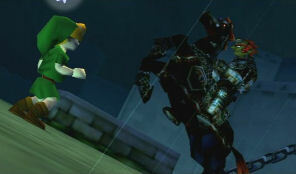 Both Ocarina of Time and Wind Walker earned 40/40 from Japanese gaming magazine Famitsu, making Zelda the only series to achieve two perfect scores from the prestigious gaming publication. Most the time when these rankings peak out from under the table, I always question their accuracy. Mainly because these rankings are often times from Game Rankings or Metacritic. While both are excellent sites and great sources for modern games, I’m not sure how reliable they are for giving rankings for games from the N64 era and earlier on. The main problem is that the earlier games did not have nearly enough reviews for such a system to work out. Who knows how a game like the original Legend of Zelda or Super Mario Bros 3 on the NES would rank if it had 60-70 reviews on them. Ocarina of Time has held the #1 spot on Game Rankings since the site established rankings but it is based off of just 29 reviews, while most modern games are near 100. Just something to think about when you see these facts pop up.